Stockholm/Rome – 5 June 2018 – Telia Carrier announced today that it has extended its network in Italy with a new PoP (Point-of-Presence) in Rome. Situated in the NaMeX datacentre in the heart of the city, the new PoP will provide crucial backbone and Cloud Connect services for major operators, content providers and enterprises requiring high-speed and direct connectivity in the region. The global wholesale carrier market in Italy is seeing a heightened demand for high capacity IP and transport services, driven to a large extent by an increase in fibre-to-the-home (FTTH), especially in the south. With this in-country expansion, Telia Carrier will be well placed to support the growing need for a variety of services across the entire length of the country, from its existing Milan PoPs in the north and the new PoP in Rome. 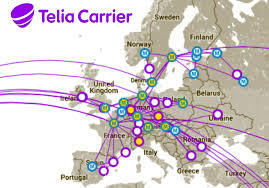 Telia Carrier’s global fibre backbone has grown organically, without acquisitions, and was the first to be 100G-enabled in both Europe and North America. It was also the first network to successfully transmit 1 Tb/s in super channels on its U.S. network. According to Dyn Research’s global backbone rankings, Telia Carrier’s global IP backbone, AS1299, is currently ranked number one. Telia Carrier’s rapid growth and ascension through the rankings was highlighted in Dyn’s ‘Baker’s Dozen’ report. The company enables worldwide connectivity by connecting more than 265 Points of Presence (PoPs) across Europe, North America, Asia, and the Middle East.